We’ve all watched in awe as the likes of Hugh Fearnley-Whittingstall and River Cottage chef Gill Meller rustle up another dish to die for using food ingredients gathered, quite literally, in their own backyard. What you might not have realised is just how widespread and accessible so many ingredients are for many popular dishes as well as the more esoteric offerings from our celebrity chefs – there’s so much more to foraging than picking blackberries in the Autumn. 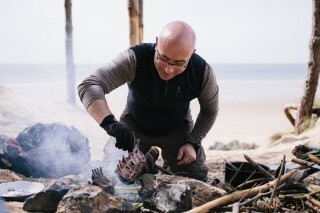 From wild garlic, wood sorrel and gorse flowers to pine buds, marsh samphire and sheep sorrel, outdoor chef and foraging expert Kieran Creevy (@kierancreevy) has created a series of walks from around the UK on which a wide variety of ingredients can be gathered in Spring, Summer and Autumn. Launched in partnership with Sidetracked magazine and featuring walks through beautiful woodland along the south-west coast of Anglesey and among the rugged mountains of North Wales, there are routes suited to all ages and abilities. So whether you want to supplement your dehydrated meal while wild camping in Snowdonia, impress friends at a dinner party with a creative new recipe or teach the kids about where their food comes from, there’s a foraging walk here for everyone with a tasty treat at the end. 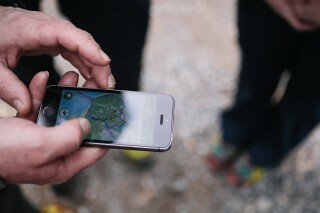 And don’t forget to share your own route suggestions using #Foraging with us on Facebook, Twitter and Instagram! By Kieran Creevy, International Mountain Leader and expedition chef. Set the grill over the fire and season the lamb with salt and pepper and leave to one side. Place the sugar and water into a small pan and bring to the boil. Whilst it’s coming to the boil, place the greaseproof paper on a dish and scatter the pine buds. Reduce the sugar syrup by half and then pour it over the pine buds and allow to cool. Place the lamb racks on the grill, placing them strategically so they char slightly but don’t burn. When the racks are cooked rare, trim the asparagus and leek, add them to the grill and cook for 5 minutes. Clean the pan, add a good knob of goats butter and bring to a foam. Add the racks and asparagus to the pan and cook gently in the butter for 5 minutes spooning the butter over both. Briefly char the leek on all sides directly on the embers. Remove the lamb rack, asparagus and leek from the heat, divide into four and and place onto the places alongside the wild greens. Spoon the ewes curd over the wild greens, scatter the candied pine buds on the curd and the gorse flowers over the lamb and dot the plates with bilberry balsamic. NEWBOROUGH WARREN - YNYS LLANDDWYN: Newborough Forest and the surrounding area is designated as a Site of Special Scientific Interest. Please remain on the network of way-marked tracks and paths to avoid disturbing nesting birds or other protected species. 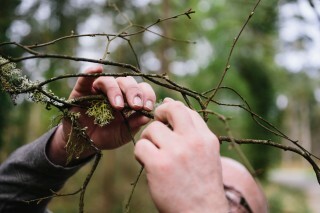 Before removing or pruning any plant (or plant remains including tree, shrub, herb, moss, lichen, fungus, leaf mould or turf), consent must be sought from Natural Resources Wales. 1. You either need permission to have an open fire or have checked with local regulations. 2. Only use dead wood, driftwood, or wood that has already been felled. DO NOT cut branches from living trees. Most land is under private ownership or owned by a state body and The Theft Act 1968 outlaws the picking for commercial purposes of mushrooms, flowers, fruit or foliage from any land not owned by the picker. Always ask permission before foraging on someone else’s property. Familiarise yourself with the law regarding wild plants, as some species are protected due to being rare, fragile, under threat or because they form a vital part of the ecosystem. 1. Know which plants, fruits and nuts are edible and how to correctly identify them. Do not consume unless you are 100% sure they are safe. 2. Only harvest if you can correctly identify the plant and the surrounding area is not contaminated. 3. Many plants are highly poisonous and can cause death if consumed. Many have poisonous look-a-likes. 4. It’s important to know which parts of each plant are edible. 5. Some plants are only edible after careful preparation e.g. cooking, washing, and removal of sections. 1. Only pick when a plant is abundant. 2. Use sharp scissors for preference, or a sharp knife. 3. Only harvest in patches, as you need to leave plants for regeneration and its continued survival. 4. Try not to remove flower or seed heads unless sourcing these specifically. Plants form a vital part of the eco-system, and many animals, insects and other organisms rely on them for survival.